Expensify is a business system used to manage expenses, transactions and money matters through its real-time data and reporting processes. The accounting functions performed by the user-friendly interface of Expensify come handy for many money management issues. It allows businesses to maintain summaries of different accounts along with calendars so that transparency can be obtained and different ratios such as debt-to-income ratios can be balanced at the right time, preventing any crisis or undesirable situation. Expensify also offers powerful tools to track your travel expenses based on the miles traveled or the amount of time spent on a particular project. For international traveling, you can convert currencies and records the information in the accurate text fields. It offers a simple solution to recording expenses such as recording expenses by the information provided through photos (purchase receipts). 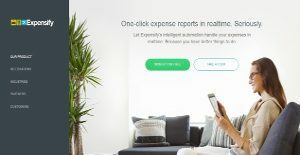 Being one of the fastest growing expense reporting software, Expensify makes it easy and quick for the businesses to manage the expenses incurred through months or years. It automates the process of expense reporting and tracking from the very act of getting receipts or making payments till the finalization of expense reports. One of the benefits of Expensify is that it allows automatic integration of the app with financial institutions, credit cards or other payment modes, so there is no need for any manual data entry of any sort. Also, you can use this app while making purchases or deposits which allows you to record information in the real time. And, if you want to sync all your account information with your mobile, you can do that right away to save transactions in both places. It allows tracking the expenses incurred on business travel trips through the GPS technology, which automatically tracks the miles traveled and records them for any kind of deductions or reimbursements. Also, you can get your currency converted through Expensify’s currency converter or rate exchange calculator. Moreover, it is supportive of a lot of integrations such as Netsuite, uber, Microsoft dynamics and so on. It integrated automatically with the CRM, ERP or another eCommerce suite for a smart management and decision-making process. There are well-liked and widely used systems in each software group. But are they necessarily the best fit for your enterprise’s special wants? A market-leading software solution may have thousands of customers, but does it offer what you need? For this reason, do not blindly invest in popular systems. Read at least a few Expensify reviews and think about the factors that you want in the software such as the price, main functionality, available integrations etc. Then, choose a few solutions that fit your wants. Check out the free trials of these products, read online opinions, get information from the vendor, and do your homework thoroughly. This in-depth homework is sure to assist you select the finest software solution for your firm’s unique requirements. We realize that when you make a decision to buy Expenses Management Software it’s important not only to see how experts evaluate it in their reviews, but also to find out if the real people and companies that buy it are actually satisfied with the product. That’s why we’ve created our behavior-based Customer Satisfaction Algorithm™ that gathers customer reviews, comments and Expensify reviews across a wide range of social media sites. The data is then presented in an easy to digest form showing how many people had positive and negative experience with Expensify. With that information at hand you should be equipped to make an informed buying decision that you won’t regret. What are Expensify pricing details? What integrations are available for Expensify? The ability to integrate with other products, such as Tsheets, is attractive, and the OCR seems to work well.